NIOSH Program Area: Radiation Dose Reconstruction, Pages One and Two including Updates. Office of Workers’ Compensation Programs (OWCP). OWCP’s EEOICP Program Statistics for Area IV of the Santa Susana Field Lab. SEE Area IV galleries where Bonnie Klea worked along with hundreds of other nuclear workers. Bonnie, Thank you for all the hard work and time you put in to help us SSFL, Area 4 workers. It is great to see that you have helped someone that has been waiting a long time since 2001 for their Claim to pass. We employees at SSFL, Area 4, put our lives on the line for the U. S. Government. It is a shame that DOL can not show us respect that we deserve for all we did for our Country by taking care of our Claims in a good timely manner. Bonnie, thank you for your many tireless years of work you have given to SSFL Area 4 Employees. Dawn my Bailey, If your claim has been accepted, it shouldn’t take too long for processing. You can contact me at bonnie1@dslextreme.com. THANK YOU FOR NOT GIVING UP BONNIE. THOUSANDS OWE A GREAT DEAL TO YOU AND YOUR LEAGUE OF SUPER REPORTERS. Bonnie Klea has helped in so many ways to so many people, I wanted to tell her thanks. Because of her relentless passion for justice in regards to Rocketdyne and the clean up and getting the cases of many workers and their families the money owed. My father [is one of them]. Edward English Morton worked there between 1963 to 1968 and was subcontracted out to the DOE in Area IV. He died in 2002 of bladder cancer. Now we are approved from the EEOICPA DOE. All six surviving children are waiting for $150,000 to be dispersed. The form E16 has been filled out and mailed back. How long does it take once you’re approved to get your settlement? you are a beautiful, wonderful person, thanks for being here. We are certainly sympathetic to your condition and hope it improves. 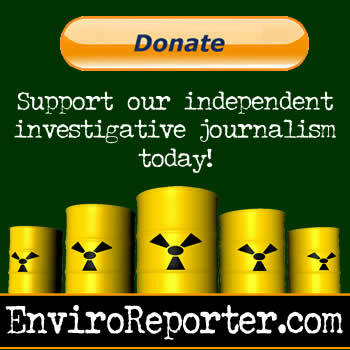 There are many resources for you to access that will help you determine what actions to take, not the least of which is this website which has chronicled our investigation of the Santa Susana Field Laboratory, aka Rocketdyne, since 1998. You would do well to connect with your neighbors and environmental activists who have been fighting to get Rocketdyne cleaned up for decades. They include the Rocketdyne Cleanup Coalition, Committee to Bridge the Gap, the Aerospace Contamination Museum of Education and the Rocketdyne Information Society (a forum). These resources may be very helpful to you in your quest to find out how and why you and others have these intestinal problems. And, of course, this website and comments section are open 24/7 to field your questions and discuss your observations as you search for answers. Please let us know if these recommended groups help you. I dont know if anyone looks at this, but for awhile now Ive been looing for someone…anyone to check ROckeydyne and Crohns DIsease and other intestinal problems….I lived on Black Canyon Road in the Knolls for years and have Crohns DIsease for 17 years…I never thought about how because the doctors dont know how you get it, but I have a friend who also has intestinal problems and was living in Box Canyon….I think there is a correlation, but dont know what to do or who to talk to to see. I saw this and you seem the right choice….your tireless work is wonderful,but I dont think anyone has looked into intestinal problems…Maybe you can help? Thank you for your tireless efforts on behalf of all of us radiation worker claimants. My family was not only extremely pleased to finally hear the U.S. Department of Labor’s admission that my father’s work as a Sr. Research Engineer at the Rocketdyne SSFL Area IV, from 1955-60 made a contribution to his early passing, but the $150K bridged the gap in my mothers retirement plan. When my father passed away within six months of discovering lung cancer at the age of 49 in 1982, it created obvious complications for my mother with two children still at home, who had no college education or work experience, and large medical bills. As a legal Italian immigrant in 1955, it’s safe to assume that being a stay at home mom would not have been too unfamiliar in our American households. My mother’s claim started in 2001, after my uncle sent me a Southern Californian news article about your battle with Rocketdyne in Santa Susana. Seven years later, after the dose reconstruction process, our claim was denied. To my luck and surprise, in 2009 I came across the Special Exposure Cohort on the internet the day after it was granted. We quickly re-submitted the claim and were paid. I am embarrassed to not have understood until reading this article that our claim followed your personal efforts every step of the way. We thank you from the bottom of our hearts. God bless your health and the health of the families everywhere that you have fought for. Also thanks to Michael Collins for his work in this area and the recognition of Ms. Klea and others that they so much deserve. Thank you KeenObserver. Made my day–made me cry. Perfect piece, Michael. Thank you, thank you. your wonderous tenacity in helping so many people. Michael, it’s an amazing article and a tribute to an amazing lady. So many of us that got caught in that bureaucratical maze of denials owe so much to her. Bonnie when you read this comment I can only say thank you. 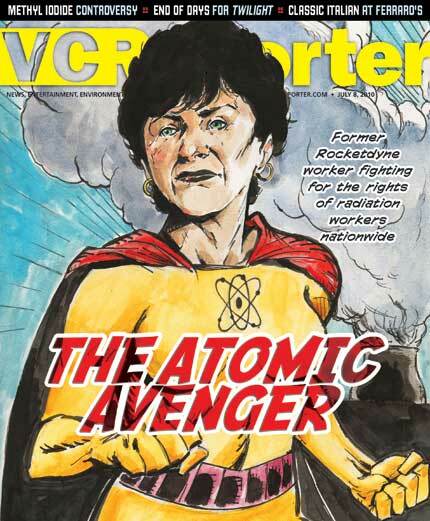 Very nice story on Bonnie, “The Atomic Avenger” She is a remarkable lady. Thank you Bonnie for all you have done. What a wonderful tribute to our own “Atomic Angel” as I like to call her. Filing a claim for compensation in greek would have been easier than it was made to us until Bonnie came into our life. She was the Berlitz of Atomic Worker Claims and has kept total strangers totally in the loop, informed, and has provided very large shoulders for us to cry on all while juggling her own trials and tribulations. Good for you Mr. Collins for being her avenger and bringing to light what you have. I can hardly find the right words to thank you for your marvelous articles, about both Bonnie Klea and Dan Hirsch. Regarding Bonnie: This remarkable lady has singlehandedly fought for the sickened SSFL workers and, against all wealthy corporation odds has WON! Bonnie totally deserves any honors that can be heaped upon her, and she really should be nominated for Hero status, along with Dan Hirsch. I believe that this TV program is ongoing, and having watched many of the hero stories, I feel that none of them could possibly match what Bonnie has survived and accomplished on behalf of others who have suffered from radiation and toxic chemical cancers, that were caused by their place of employment. Regarding Dan: Thirty years of non-stop,utterly time consuming and voluntary effort to clean up the partial nuclear meltdown on the SSFL site….and 40 years of nuclear prevention work,with the Committee to Bridge the Gap around other parts of the USA, along with testifying before Congress….all make Dan an exceptional human being, who continues to “do what is right”..no matter what! And this “no matter what” includes, as with Bonnie, using his own personal time and energy,never getting burned out, and never throwing in the towel when criticism or impossible situations arise. They both just keep going! Just imagine both Bonnie and Dan constantly having the courage to get up in the faces of powerful and wealthy corporations, and challenging rigid Government agencies that only react at less than a snail’s pace. Who in the world could possibly find enough ways to honor such leadership and agonizing effort for so many years? Bonnie and Dan have never stopped doing exactly this. They both deserve our respect, love and enormous gratitude….so thank you again Michael…your articles are a wonderful start in paying our debt to these two amazing people. Bonnie Klea is the best of us. She’s the best of the human spirit as well. There are 15-20 people actively pushing the Rocketdyne Project forward into what ever future it has. All of us are dedicated to getting the place characterized, cleaned up and preserved. Bonnie is different… she’s helping people in need. Working alone and without compensation, she’s relieving suffering and pain. There is a scourge of cancer surrounding SSFL. A causal connection with the field lab cannot be proven. Childhood cancer, “…like a curse from the Gods” horrify us all. Ex-workers who have suffered the debilitating effects of this disease have had the added humiliation of being denied medical coverage by the corporations they helped enrich and the government they served, sometimes for decades. Bonnie is their champion. She is one of them. She’s effective. I think she’s effective because you can’t deny what she’s fighting for. She doesn’t like politics, she doesn’t want recognition or fame, she certainly isn’t going to get rich. She only wants to help people. The fact Bonnie exists is one of the things that gives me hope for humanity. She is a selfless counterbalance to the greed and selfishness that is all too prevalent in our culture. I wish more people could learn from her example. I’m proud to call her my friend and I feel humbled and privileged when she stands next to me. Bravo Bonnie. You are made of the stuff that Boeing and all of the other corporate bullies fear most. Your tenacity and intelligence has benefited so many workers. I only wish the government would now include the unsuspecting residents of the area who have been harmed for decades. Michael, you have magically transformed hard data and unpronouncable chemical names into a fascinating and suspenseful story. Your ability to condense complex scientific concepts into language the rest of us can grasp brings the issues into sharp focus. It makes us want to demand justice from these entities that seem to find new ways daily to contaminate our lives. When you tell the story, we get it. Thank you for your endless energy in pursuit of a fairer and cleaner world.